This is a guest post from our good friend, Bob Pensak, owner of the English language school, Bob’s English, in Okazaki, Japan. “Felt boards” are an exciting, fun way to tell a story by combining music, movement, and visuals. Then, cut the large felt piece large enough to wrap around the edges of the board. Spread the glue evenly on one side of the board and glue the felt to the board. Turn the board over. Wrap and glue the edges to the back. Let dry thoroughly before you use. The smaller colorful felt will be used to make your characters. These seem to magically stick to the felt board! You can also use velcro (also known as magic tape or hook-and-loop tape) or tape to secure larger pieces to the board. Choose a song such as “Five Little Monkeys“, “Ten In The Bed” or “Mary Had A Kangaroo“, and cut the felt pieces into the cast of characters in your story. 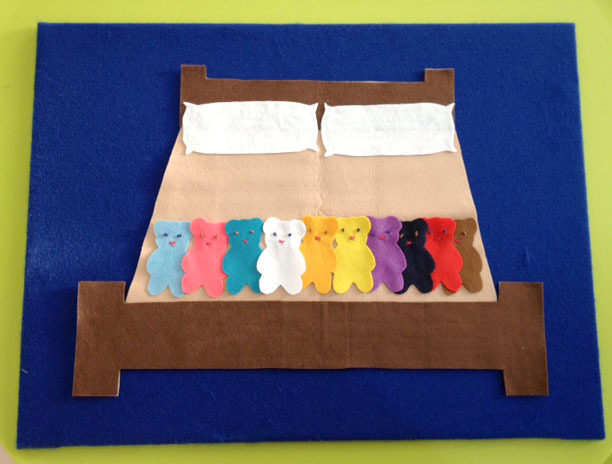 You can decorate your felt characters using color pencils, markers, and wiggle eyes. How many are in the bed?! You can also make your characters by laminating paper cut outs and adhering velcro or tape to the back. Be sure to make your characters colorful and visually exciting. 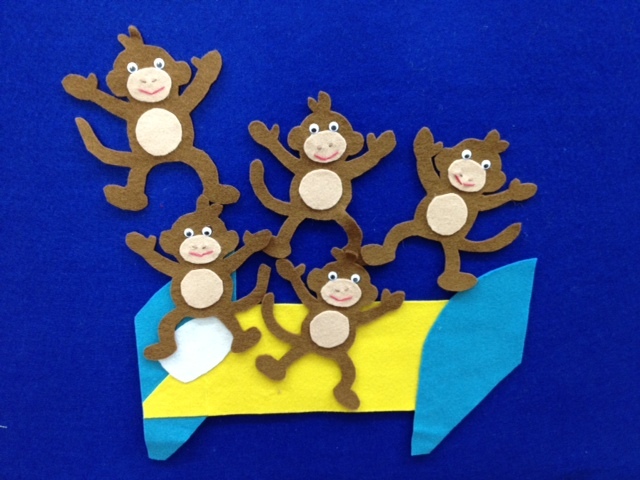 5 little felt monkeys jumping on a felt bed! Have your students sit down. Place the felt board on an easel or table so all the children can see. Place your felt characters in a colorful box or hat. Put on your song, and use gestures to tell your story. The children can takes turns putting on or taking off the felt pieces. Count the pieces as you put them away or take them out. Say, “Hello, Giraffe” or “Goodbye, Monkey” or whatever characters are in your story. To see a felt board in action, here is a video of “Mary Had A Kangaroo”. Look at those looooong necks! A song such as “Mary Had A Kangaroo” is a good song to make use of the element of surprise. Slowly pull the pieces out of a hat or box and have the kids guess what will be next! Use your imagination, be creative, and keep it Super Simple! Bob Pensak lives in Okazaki, Japan with his wife and four-year-old son. 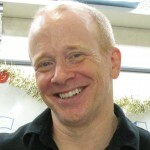 He is the owner of Bob’s English and has been teaching English to children in Japan for twelve years. Check out his blog, Bob’s Frog, for more teaching tips. You can also find more posts from Bob on the Super Simple Learning Blog here.